Looking for the perfect ingredient to spice up your meal or make it taste just like it did back home? Sometimes the supermarkets just don’t have what you need, but with our guide to spice shops and specialty food stores in Ghent, perhaps you’ll find what you’ve been missing – or something new and delicious! 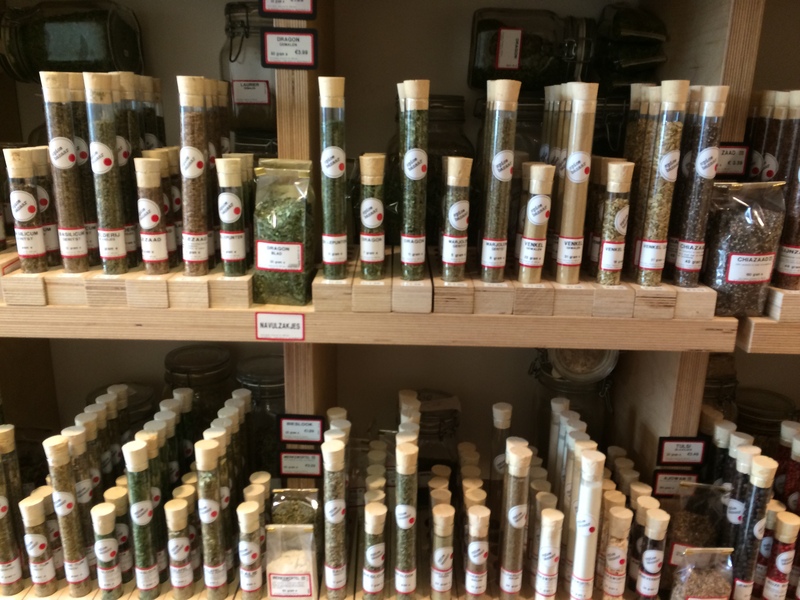 This unassuming little shop on the corner across from St. Jacobs church is chock full of bags of herbs, spices and teas. You can find common herbs here but also things like olive leaf, orange blossom and black sesame seeds. There are also spice mixtures, such as tandoori spices and a stoofvlees mix. As you wander the aisles of little bins, you also come across wasabi nuts, and dried fruit and nuts. There is nothing fancy about this place and they don’t have a website, but that is also reflected in the reasonable prices. You can get a 100g bag of oregano for 1.55 euro. Melanie’s World is a small store that has a large range of product offerings. As the name suggests, Melanie stocks a hand-picked selection of wine from all over the world (including the U.S.) but there is much more here. If you want to make Mexican food, this is the place for you – real corn tortillas, as well as masa if you prefer to make your own, refried beans, chipotle peppers in Adobo sauce, canned jalapenos, and a variety of other Mexican items fill the shelves. In addition, she stocks Asian spices and products, including Korean goods. And if you have a hankering for Philippine dried mangoes, you can find them here. 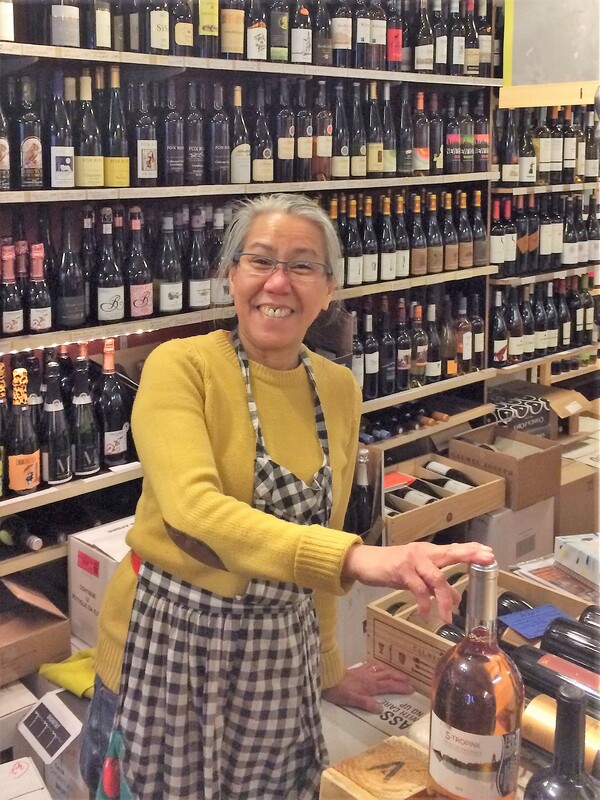 One of the best things about the shop though is Melanie – she is incredibly friendly and helpful and she updates her products to keep up with current trends and shopper’s interests. Definitely the most beautifully presented shop of all listed here, Spice Bazaar is down the street from Gravensteen and is filled with a lovely selection of herbs, spices and teas. If you can’t find it here, you might not be able to find it at all in Ghent. Customers can choose from Mexican hot chocolate, mole mix, star anise, mustard seed, Szechuan peppercorns and an assortment of dried chiles just to name a few. In addition to spices, there is also a small selection of dried insects you might wish to sample for a daring menu! The herbs and spices are displayed in test tube-like vessels of varying sizes, though you can also find them in larger bagged quantities. They also sell the wooden racks to hold the spice tubes and you can buy premade sets such as dessert spices and meat seasonings. Or, create your own for a unique gift. 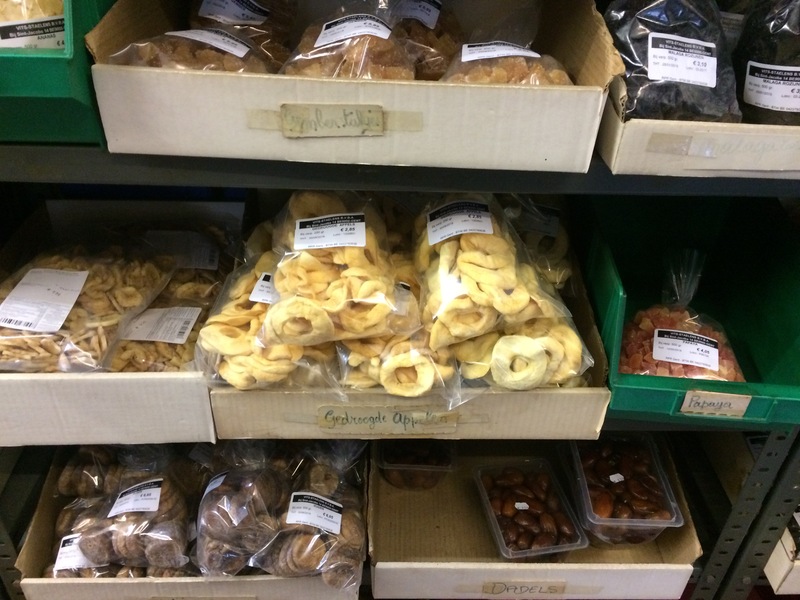 The selection of dried fruits is also extensive – dried papaya, mango, kiwi, and berries among others. 50g of oregano will cost you 1.99 euro. At Dille & Kamille, you can find an assortment of baking and cooking utensils and other goods but you can also find herbs and extracts. They have your common herbs, such as oregano and basil, and a variety of sea salt combined with garlic, rosemary or chile pepper. They also have teas, pestos and chutneys. There is real vanilla extract – not the imitation found in most shops in Ghent. 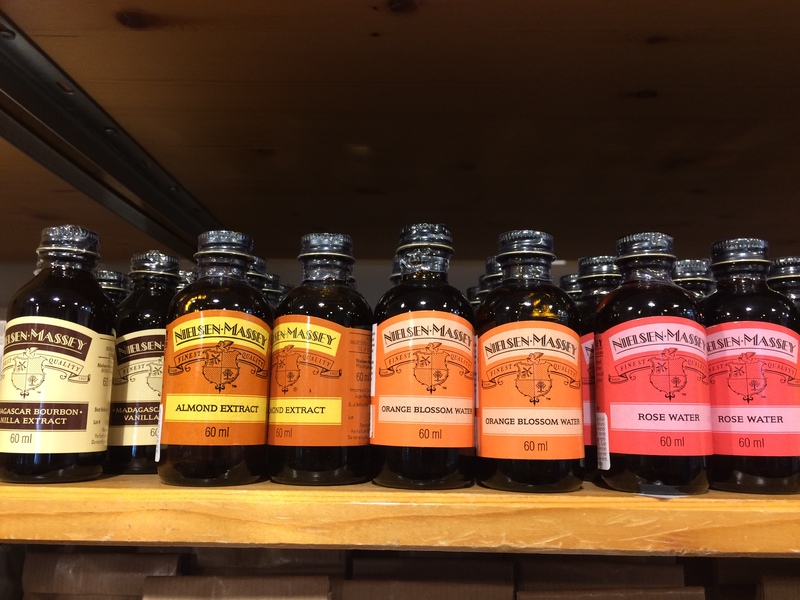 They carry Nielsen – Massey extracts including Madagascar Vanilla Bourbon extract, almond extract, orange blossom, rosewater, lemon and peppermint, as well as maple syrup. If you are looking for a large container of baking soda, you can also find it here. They sell 200g for 3.50 euros. A 20g bag of oregano goes for 1.75 euro. 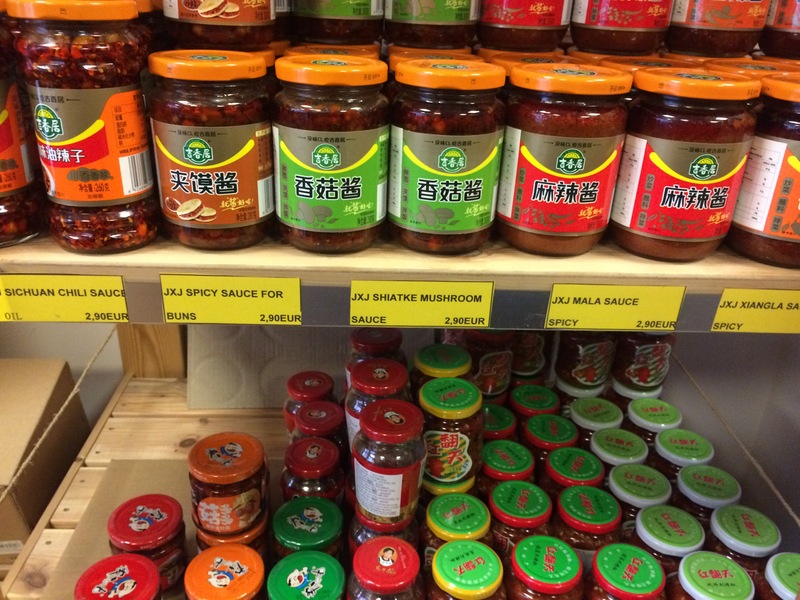 While Dun Huang might not be considered a “spice shop” per say, it is full of all kinds of unique products for cooking your favorite Asian meals. They do carry spices such as curry powders, garam masala, coriander, cumin and others. But the real draw is the array of sauces – you have so many soy sauce options you won’t know what to pick! There are also all types of chile sauces, sesame oils, rice wine vinegars, etc. And if you want to make sushi, all you need is here – rolling mats, cutting tools, nori, large bags of sushi rice and everything else you might need. They also offer frozen wonton wrappers, gyoza and dumplings, edamame and other treats. The noodle aisle is full of ramen, rice noodles, and other varieties. You will also find their tofu a cut above the supermarket brand. 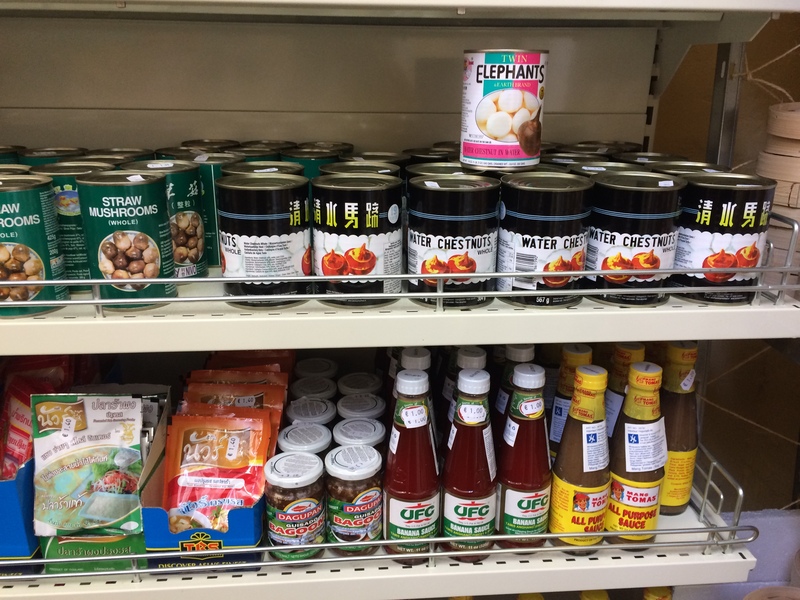 Located in the Coupure area, this Thai market carries many of the same products as Dun Huang, including tofu, TRS brand spices, large bags of rice, assorted noodles and Asian sauces. They also have many choices of coconut milk and cans of water chestnuts. They carry bags of baking powder instead of the tiny separated packs you can get at the supermarket. This market is basically a dayshop that has a nice selection of Indian and Asian products on one side of the store. 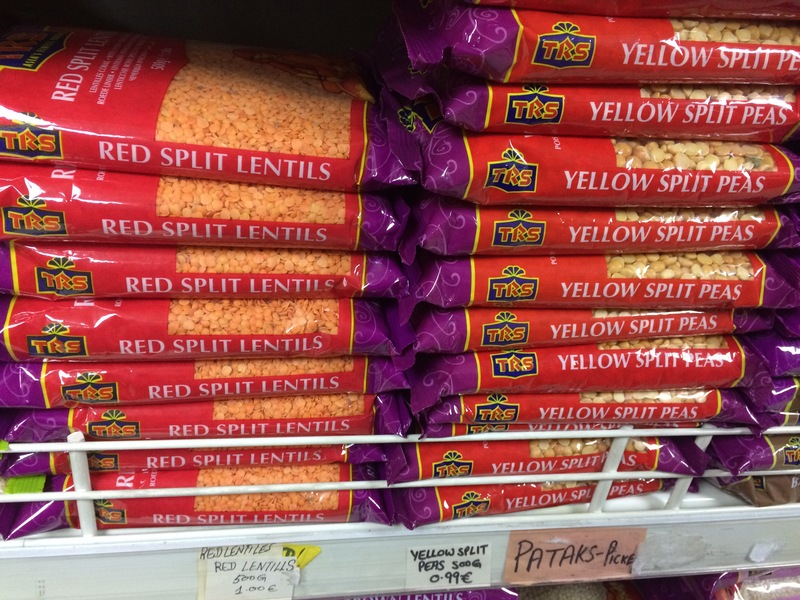 They carry the typical TRS brand of spices, beans and legumes but they have big bags of these items which are hard to find elsewhere. They have black eyed peas, all variety of beans as well as harder to find herbs and spices such as Walnut Root Bark, Indigo leaf, Goond and Tamarind. They have large bags of both fine and coarse cornmeal, buckwheat and semolina flour and all kinds of masala. There are many brands of ghee to choose from too. I did find though that some products were past their expiration date, so be sure to check when buying things like yeast or other products where freshness is key. 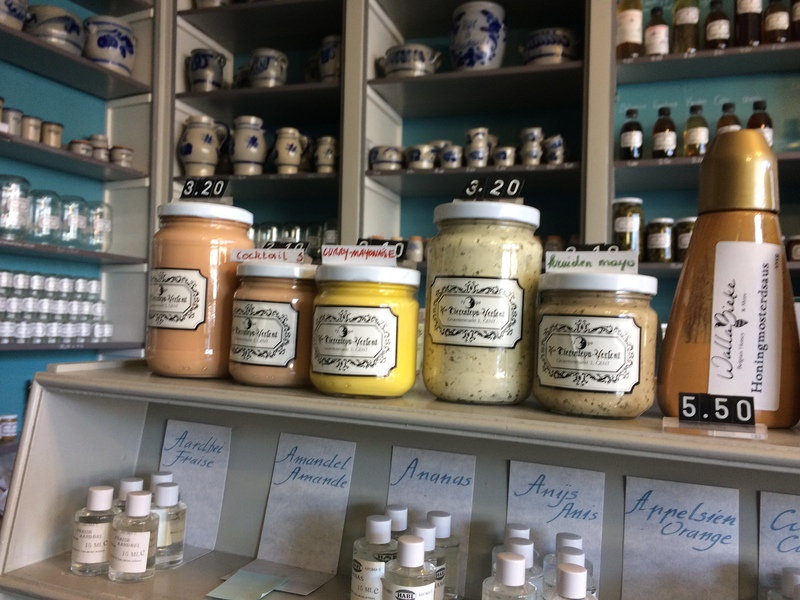 You have probably heard of this shop because of their famous mustard, but customers can also purchase peppercorns, extracts, vinegars, herbs & spices. Tevhid Supermarkt is a large market in Dampoort with an extensive selection of Mediterranean and Middle Eastern products. You can find spices, an olive bar, phyllo dough, tahini and many other packaged and fresh products. Along this street you will find Odra Supermarket, selling mainly Polish products and African & Asian Foods, who stock dried fish and large sized bags of beans and spices among many other products. Any spice gem we missed? Let us know in the comments below or by send us an email. Note: The information included is based on the author’s visits to the shops in March 2018. Be sure to check directly with a shop before visiting in case opening hours, address or selection has changed.